The Elements Life Reward Points program rewards customers with future savings for every dollar they spend in our store. No signup is necessary. Customers earn 1 point for every $1 spent and can apply them for a discount on a future order. Minimum of 100 points required to redeem. Your Elements Life Reward Points (“Points”) account (“Account”) is issued by Pink Lotus Elements, LLC (hereinafter “we”, “our”, or “us”) located in Pacific Palisades, CA. In these Program Rules and the Redemption Rules, “you” or “your”, means all persons responsible for complying with this agreement, including the person who signed up for the original customer account on our website at https://pinklotus.com/elements or https://pinklotus.com/shopelements (the “Store”). If your Account is in default or has been closed due to a violation of our terms and conditions, as applicable, and/or there is any fraud or abuse related to the accrual of Points, we reserve the right to prohibit you from earning points through your Account until your Account is no longer in default, and to cause you to forfeit any Points in your Account. If your Points are forfeited for any reason, we will not reinstate these Points to your Account. If your Account is closed for any reason, including you requesting the closure of your Account, your membership in the Program will be terminated and your Points will be forfeited. You will earn 1 Point for every $1 of Net Purchases made in our store. “Net purchases”, for purposes of this agreement, means purchases exclusive of shipping costs, taxes or any other ancillary fees, and inclusive of any discounts, sales or coupons applied to your order. As a result, you will receive Points for the total amount you are paying at checkout, not counting taxes, shipping fees or other additions. Points are earned for whole dollar amounts only, cents are not earned and do not count towards your Points balance. Points earned are not transferable and cannot be used for any other purpose except to apply them towards any of your future orders in the Store. If there is any abuse of the Points program, failure to follow the terms outlined herein, or any misrepresentation by you, all unredeemed Points shall be forfeited and no additional Points shall accumulate. There is no maximum number of points that you can accumulate in the Program. Any special bonus or promotional offers may have a maximum accumulation. Points earned in this Program automatically expire 3 years after they are issued without any notice given by us to you (the “Expiration Period”). Points earned are not available for redemption until you have accumulated a minimum of 100 Points in your account. Once you accumulate a minimum number of 100 Points, each 100 Points earned can be redeemed for a discount equivalent to $1.50 on a future order you place in our Store within the Expiration Period. To redeem your points, you must first be logged into your Store account with the same user account you used to accumulate your Points. Upon checking out your order, you must select that you wish to redeem your Points. Failure to make this selection will result in your Points not being applied to your order. You may redeem points for any eligible items in our Store. If an item is not eligible for Points redemption, it will be clearly marked as such. If any balance remains due on a purchase after you apply your Points balance, you may use any of our other accepted payment methods to settle such balance. We will subtract points that you elected to redeem for your purchase at the time your item is fulfilled, so long as your account is open and is not in default. Your Points balance may not reflect redemptions for pending purchases until the purchase has been completed and fulfilled. Points for orders that remain unfulfilled for 30 days will automatically be credited back to your account. Points will be credited back to your account for valid returns only. Returns and refunds are subject to our shipping, exchange and refund policy. You are responsible for any tax liability, including disclosure requirements, related to participating in the Points program. We reserve the right to approve, deny or revoke participation in the Points program for any reason whatsoever. The Points program and the discount benefits offered herein are provided by us to you as a reward for purchases you have made in our Store. However, we reserve the right to cancel, modify, restrict, waive, temporarily suspend, or terminate the Points program or any aspects, features or benefits of the Points program at any time without prior notice, including, without limitation, point accrual or redemption criteria. Neither Pink Lotus Elements, nor any of our directors, officers, shareholders, agents or affiliates shall be liable for any bodily harm and/or property damage and/or lost opportunity, which may result from participating in the Points program. The Points program is void where prohibited by federal, state, or local law. The rules and regulations set forth herein comprise all the terms of the Points program. We have no other obligation with respect to the program beyond those described in these rules. Do I have to sign up to earn points? When can I start redeeming points? 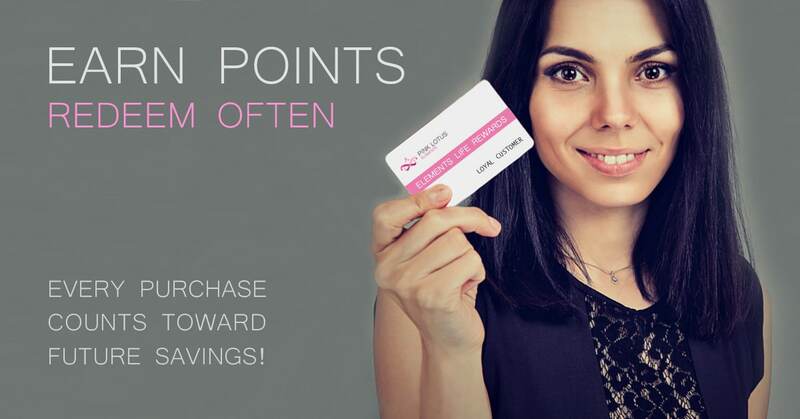 No, every purchase made with your store account will earn you Reward Points. To start redeeming points, you need to have a minimum balance of 100 reward points accumulated in your account. There is no limit to how many reward points you can earn. Elements Life reward points expire 3 years from the date they were earned. In order to see your current Reward Points balance, you must log into your account dashboard and click on ‘Reward Points’.